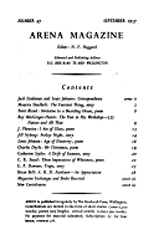 An antipodean appearance of Henry Reed, in the Wellington, New Zealand literary magazine Arena (Noel Farr Hoggard, ed. ), from March, 1958, where Roy MacGregor-Hastie wrote a contentious, four-part series of articles on the state of poetry, titled "The Poet in His Workshop." There is little of the morbid, though a great deal of the introspective in the writing of Henry Reed, who I should have liked to have included in this article as a vertical man. However, he is at an angle of ninety degrees to himself, so I shall leave him for the Miscellaneous section of this series, and deal with Alexander Tvardovsky, a contemporary Soviet poet. Arena, no. 46 (March 1957): 18. Arena, no. 48 (March 1958): 12-13. MacGregor-Hastie's respect and appreciation for Reed is laudable, if a bit idealized: Reed, even as early as the late 1950s, was hardly remaining 'cheerful' and 'unperturbed', and he probably would have taken more than some offense at the author's rough-handling of his friends, Spender and Day-Lewis—not to mention his idols and authorities, Auden and Eliot.